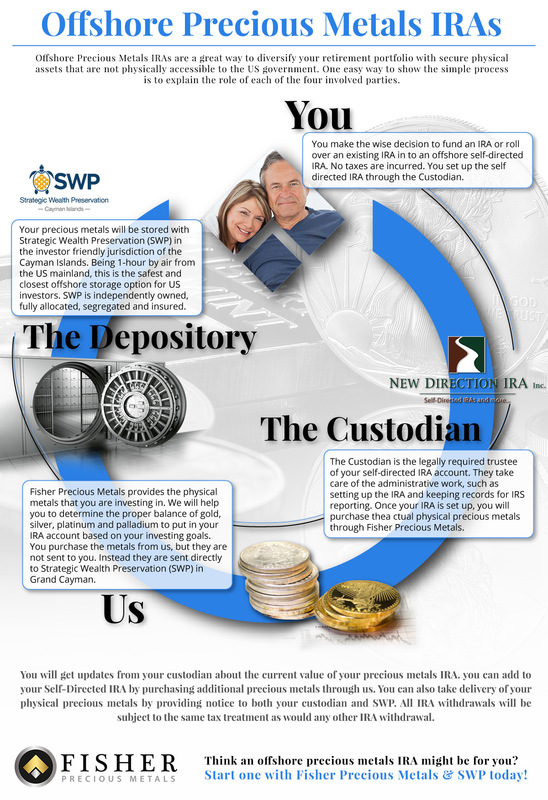 Fisher Precious Metals, SWP and New Direction IRA have partnered to offer American investors the opportunity to purchase and store precious metals held in their self-directed IRA in the Cayman Islands. Grand Cayman allows you to benefit from all of the advantages of holding precious metals in your self-directed IRA and the peace of mind that comes with storing your assets in the best, safest and closest offshore jurisdiction in the Western Hemisphere. Click here to listen to a live interview with John Fisher of Fisher Precious Metals and Mark Yaxley of Strategic Wealth Preservation on “The Benefits of Offshore IRAs”.